When AOL first announced they were discontinuing Netscape, they recommended Firefox (a logical choice for many reasons). Since then, they’ve also started heavily promoting Flock—to the point of offering seamless upgrades from NS8 to Flock. (In theory, anyway; I fired up the copy I had for testing and couldn’t get it to do anything but update to the most recent 8.x version. Confirmed. I let it sit open in the background for a while, and it eventually popped up the offer for 1-click Flock migration.) Netscape 9 has an update notice that offers to download Flock or Firefox. The key issue, of course, is moving as many users as possible from a discontinued browser—there’s no doubt that security holes will be found in it over time—to one that is actively maintained. Why Flock, specifically? Well, sticking with the same toolkit and user profile makes migration easier, so that narrows the field to Firefox and Flock. (Not sure about SeaMonkey’s profile.) Since Netscape 8 and 9 were big on integrating with websites, Flock’s “social browser” seems a slightly better fit. And it turns out most of the Netscape 8 team went on to build Flock. Talk about social networking! 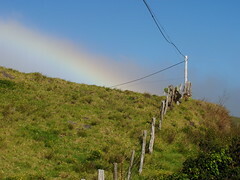 This entry was posted in Web Browsers and tagged AOL, browser, flock, Netscape, Web on April 2, 2008 by Kelson. It’s been a long time coming, but AOL has officially decided to shut down the Netscape web browser. The final security updates for Netscape 9 will go out in February, and then that’s it. It’s been on life support for a while now, as AOL has tried repeatedly to revive it. After they dismantled the Netscape team in 2003 (just before spinning off the Mozilla Foundation), everyone expected that would be the end, but they came back with a surprise update, Netscape 7.2, the following year. Then they hired an outside company to reinvent it as a mash-up of Firefox and Internet Explorer, producing the Netscape 8 chimera. And just a few months ago, they went back to the well and released the Firefox-based Netscape 9, trying for the Flock model of integration with social networking sites…but only integrating with their own. So what killed it? Netscape was arguably the pioneer, building on Mosaic’s success to create the first widely-used browser on the fledgling World Wide Web. The commercial-to-freeware transition. Back in the 1990s, the only business model for giving away a free web browser was to subsidise it with revenue from other products. This led to selling the company to AOL, and opening the source code. The disastrous Netscape 6. While there’s something to be said for meeting deadlines, Netscape 6 was a prime example of why not to release early. The program just wasn’t ready (Mozilla actually declared the code to be 0.6), and it turned off many users who might otherwise have stuck around a little longer for a stable release. Fundamentally, though, AOL never seemed to know what to do with it. Is it a product? An exploitable brand name? A threat to brandish during contract negotiations with Microsoft? It’s interesting that, as I made this list, I realized that the transition to open source really didn’t help Netscape, the company. But it led to the formation of the Mozilla Foundation and the release of Firefox, one of the most visible open source success stories out there. The company and brand name withered, but the code itself flourished. Like the demise of IE/Mac, it’s more of a symbolic end than one of substance. In my opinion, the true “heir” so to speak of the early Netscape has been Mozilla, and now Firefox, for quite some time. Update: Asa Dotzler has a somewhat less nostalgic take on the matter, as well as a link to commentary at TechCrunch. I can’t believe I forgot to mention the crippling/crufting of Netscape 6-7 as compared to Mozilla. Update 3: Some commentary from the Web Standards Project, with a somewhat familiar-looking title. 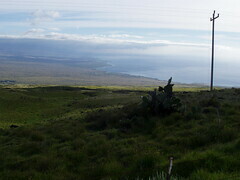 This entry was posted in Web Browsers and tagged AOL, browser, Netscape, Web on December 28, 2007 by Kelson. You’ve probably heard by now that AOL and Yahoo are preparing a system by which large-volume email senders can pay to get their mail sent on to subscribers. You probably haven’t heard that it’s not just pay-to-send so much as it’s pay-to-get-accredited. Senders pay a company called Goodmail to say “we won’t send spam,” Goodmail checks them out, and Yahoo and AOL use Goodmail to bypass their regular spam filters. What’s funny is that this conundrum has been almost exactly like the controversy two years ago over Microsoft choosing Bonded Sender as an accreditation service/whitelist for Hotmail—knee jerking and all. This entry was posted in Computers/Internet, Spam and tagged AOL, flamewar, Goodmail, knee-jerk, reaction, yahoo on February 13, 2006 by Kelson. I’d seen an AOL CD packaged to look like laundry detergent before (Tide, specifically), but this seems to take it a step further. 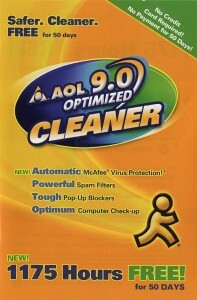 I think what makes it seem strange to me is the fact that they made “Cleaner” more prominent than “AOL.” Sure, you can’t miss it, especially with the running man icon, and of course they’re plugging their filters and bundled antivirus (to clean your computer), but it just seems like they’ve taken the metaphor a bit far in the design. This entry was posted in Signs of the Times and tagged AOL on March 6, 2005 by Kelson. CNET has posted a write-up of AOL’s new Netscape prototype based on Firefox, as well as a screenshot. It seems to be a combination of Firefox + theme + bundled extensions… plus a mode that embeds Internet Explorer for compatibility. There are some nice ideas: adapting Firefox’s RSS capabilities to create a headline ticker, for instance, and the Firefox team has been talking about bundling extensions since it was called Phoenix. As for the embedded IE mode… on one hand it provides a convenient solution to the biggest criticism laid on all non-IE browsers: they don’t render pages exactly the way IE does. But it comes at the cost of all the security risks inherent in IE itself. It does remind me of the “View with Gecko” option Konqueror used to have (and probably still does on some systems). But the clutter… The sheer number of buttons, icons, widgets etc. in that screenshot is staggering. Even after installing the web developer extension I don’t think I have that many buttons on Firefox. 3+ buttons on the tab bar, 3 icons on each tab…. I hope that CNET was just enabling every feature they could find to get them all in one screenshot, but if AOL is trying to bill it as “easier” than Firefox (which was created with a simple user interface as a design goal), they’ve got to try another approach. Further Update: MozillaZine has posted a more thorough review. This entry was posted in Web Browsers and tagged AOL, browser, Firefox, IE, Mozilla, Netscape, Web on November 30, 2004 by Kelson.